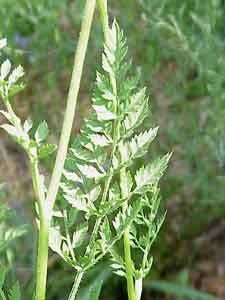 Description: From 1 to 5 feet tall, Leaves are large but divided into many small narrow sagments and subdivided. 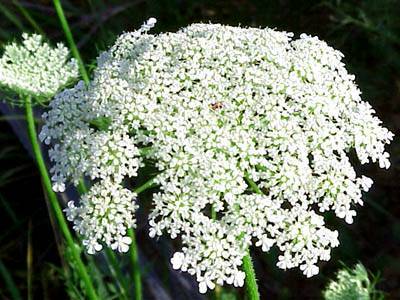 Flowers are extremely flat clusters and form a lace like pattern, hence the name Queen Anne's Lace. 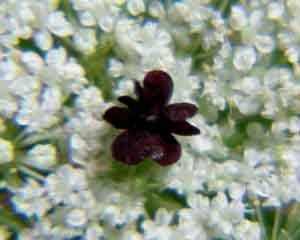 Center of flower cluster often has a single deep purple floret note Picture below. 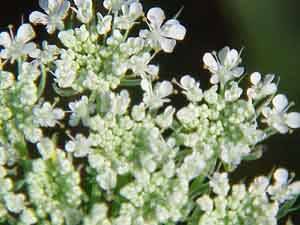 Old flower clusters with maturing seeds cul to form a cup "bird nest" another common name. Skin irritant to some and if eaten by milk cow's it will give there milk a sour taste.